Communities in Chocó are fleeing for their lives due to combats between the National Liberation Army (Ejército de Liberación Nacional– ELN) and the neo-paramilitary group, the Gaitanistas Self-defence Force of Colombia (Autodefensas Gaitanistas de Colombia – AGC) . These combats are a part of a struggle for the control of strategic areas for coca cultivation and mechanised small-scale gold mining abandoned by the Revolutionary Armed Forces of Colombia (Fuerzas Armadas Revolucionarias de Colombia – FARC). Despite a strong military presence in Colombia little action has been taken to protect these communities by the State. According to the Bishop of Quibdó: In Chocó (one department of Colombia) 20 out of the 30 municipalities have been declared in a state of “Alert” due to combats between the ELN Guerrilla and neo-paramilitary groups (BACRIM). This is exacerbating the humanitarian crisis in the department. As the Colombian Government and the largest guerrilla group, the FARC, seek to implement the Peace Accord, levels of violence and human rights abuses soar to unprecedented levels in the rural areas of Colombia. The second largest guerrilla group in Colombia, the ELN started Peace Talks on 7 February 2017 with the Colombian Government, however, no bi-lateral ceasefire has yet been agreed. The other illegal armed groups that continues to operate in Colombia are the neo-paramilitaries; referred to by the Colombian Government as ‘Criminal Gangs’ (BACRIM by their Spanish acronym) and they continue to grow and consolidate. These neo-paramilitaries threaten and perpetuate violence against rural communities and their leaders. 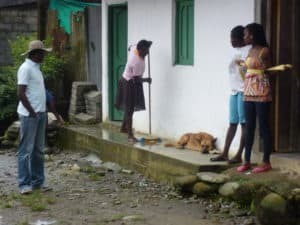 They confine the movement of communities, are using antipersonnel mines, generating forced displacement all of which is exacerbating the humanitarian crisis that exisists in Chocó, and intensifying the situation of poverty. Thousands of people from communities across Choco are being forced to displace due to combats between the ELN and the neo-paramilitary group the AGC . These combats are a part of a struggle to control strategic locations for coca cultivation and mechanised small-scale gold mining in areas abandoned by the FARC guerrilla when they moved into Transitional Local Zones for Normalisation (ZVTN) to disarm. Despite the Early Warning Alerts and the presence of a Joint Task Force TITAN (Navy, Army and Air Force) based in Choco , no effective methods were put in place to help protect the local population and to prevent the displacement. TITAN have a force of over 2,500 troops based in Chocó. According to Monseñor Barreto it is insufficient to call many of the illegal groups operating in Chocó ‘Criminal Gangs’; they are in fact neo-paramilitary groups. The Bishop explains in an interview with El Espectador , that the Dioceses has information that, in some areas of the country, there are links between the neo-paramilitary groups and the Security Forces. He goes on to say that it is essential that the Security Forces undergo an internal review to identify those with links to the neo-paramilitaries and then ensure that they are dismissed from the Security Forces and are no longer able to act in the name of the State. • Initiate an inter-institutional and intersectoral working group to formulate a specific plan to and allocate sufficient resources to address the issues of unemployment, education, health and public services in the marginalised region of Chocó.